Â Photo courtesy of Flickr. Today’s Wall Street Journal writes that General Motors is planning an entire family of electric automobiles that will share major components with their regular gasoline cars, which will save significantly on production and design costs. Ideally, GM would like to use a common chassis that can accommodate either a traditional gasoline engine and transmission or a battery-powered E-Flex powertrain. GM and other car makers have at various times responded to political pressure to increase U.S. fuel-efficiency standards — known as corporate average fuel economy, or CAFE — by throwing open the doors of their normally secret research and development labs, in part to impress upon lawmakers the argument that money spent on incremental increases in the fuel efficiency of current models could siphon cash away from researching technology that might produce super-efficient cars tomorrow. Legislation to boost fuel economy is pending in Congress. Industry critics counter that when it comes to fuel economy in the U.S., tomorrow never seems to come, as the average fuel efficiency of U.S. cars and light trucks has barely budged since the mid-1990s. GM executives say the Volt will be a real car, and is under development. GM also plans to launch soon gasoline-electric hybrid versions of its large sport-utility vehicles. GM’s electric cars have a battery to store power and use an internal combustion engine only to recharge the battery, not to turn the wheels. Hybrids use either an electric motor or an internal combustion engine, or both, to turn their wheels. At the Frankfurt show, GM’s Opel unit showed a concept for a sleek electric hatchback that pairs an electric motor with a 1.3-liter diesel engine. Called the Flextreme, it would be able to run for 40 miles on power from a large battery pack that can be recharged during longer trips by the engine. Like the article itself, I am a bit skeptical, although hopeful that GM will go through with the plan. Seems to me though, that as soon as the next recession hits and oil and gasoline prices fall back down, these designs will go right into the dustbin of concept cars that never get developed. My hope is that one of the startups like Tesla, Phoenix Motorcars or Miles Automotive Group will launch a real car that takes off like the Prius, forcing the mainstream automobile manufacturers to respond. After all, thanks to the success of the Prius, most of the major manufacturers have hybrid cars on the road or in the pipeline for launches soon. Even brands like Porsche! How much would an electric car need to cost before you would buy it?Â If the upfront costs were $5K to $10K higher, but you’d make it back on reduced fueling, would you still be willing to pay it?Â And would 150 to 200 miles per charge be enough for you to buy one, or would it have to be more than that? For me, as soon as a real electric car hits the road that is at least as big as a Civic or a Prius, goes at least 150 miles per charge and costs less than $50K, I’ll buy it. 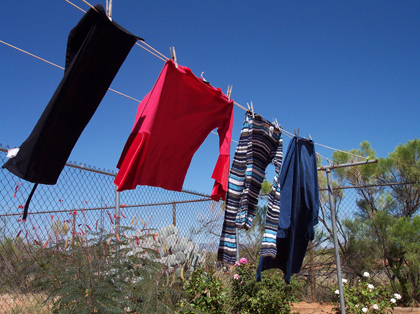 Next post: Clothesline users of the world, unite!